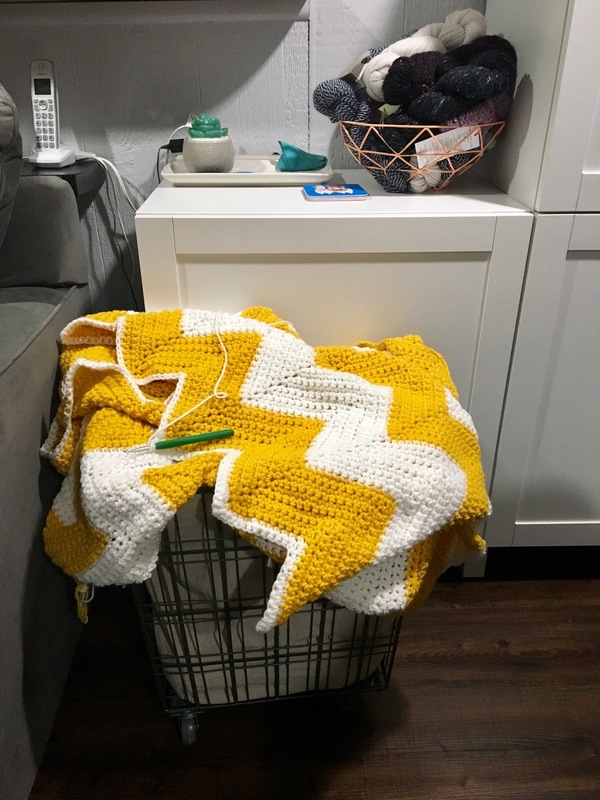 Before attending Vogue Knitting Live NYC 2019 this past January I reorganized my yarn stash, projects, and tools to get a better idea of what I actually own and need. In that process I stumbled on a very old project (the oldest actually) that has been sitting in a large tote bag for years. 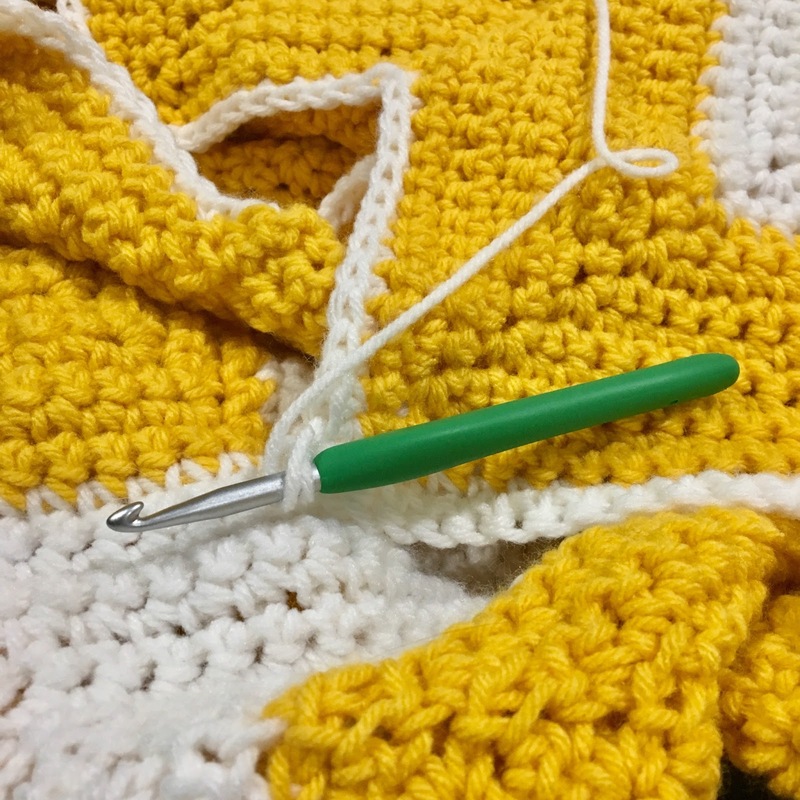 Way, way back in 2015 (at least I think it was 2015 according to old blog posts) I started crocheting this amazingly cheery chevron blanket. It was from a free pattern by Krista Winters that seems to be currently unavailable. Thankfully I wrote down the instructions and shoved it in the tote bag. Seeing this old forgotten WIP made me feel a little sad. How could I forget about these gorgeous bright stripes of sunshine? The blanket looks like it's half way done so what's stopping me? I moved it out of the dusty tote bag and into a rolling cart that I keep next to my couch. Now, I can't say that I've been inspired by it's vision to work on it everyday. Definitely not. The fact is the blanket is dusty and a bit cumbersome. I don't want to have it weighing on my lap right under my nose causing a sneezing fit. Thankfully though, I figured out I can actually keep it in the rolling cart as I work on it. Problem solved. I'm hopefully going to be moving into a bigger apartment around September/October and I have visions of snuggling under this blanket out on the closed-in porch in an overstuffed chair as the fall air rolls in. Thats only 5-6 months away. The countdown begins. For more information on this project, check out my ravelry project page and my old blog post from 2015. If you are interested in making a similar blanket then check out these Ravelry search results. There are beautifully designed crocheted blankets out there just waiting for you to cast on!